Already in October, the vibes change both for bees and beekeepers. And in November the most interesting begins. Nevertheless, summing up, establishing order and season’s closing does not foreshadow peace and quiet at all. Especially if your “beexperience” no more than 2-3 years. In our family, we have been engaged in beekeeping for over 15 years, so I would like to share some tips and observations about winterizing bee hives from my experience. Hope the table of contents will help you. November marks the first full month bees do not have much to forage on. During November, flowers have all but stopped blooming and bees are diving head first into winter. Activity in and out of the entrance is minimal and inside the hive, keeping the queen and any brood present warm is the first priority for winter bees. And it’s time to think about winterizing bees and winter beehive management. The lank, golden plumes of the goldenrod flower and other asters that provided the fall nectar flow have subsided and almost gone by November and cold weather has set in. As these flowers were the last sources of nectar for the bees, it’s time for the bees to settle in for the winter. The population of the hive is not at it’s lowest, but the population is decreasing daily. Bees are still propolising seams in the hive to weatherproof it from the cold. Bees will typically only fly when the sun is shining at the entrance of the hive and the temperature is about 50°F (about 10°С), so don’t expect to see them on those chilly mornings. On these days, the bees are likely not foraging, but cleaning the hive of dead bees and going to the bathroom outside the hive. If you look at the entrance on these days, you can see the “mortician” bees carrying out the dead and flying off with them. This is one way they keep the interior of the hive free of disease. When the days are warm enough, bees are more often busying themselves with the chores of the hive, rather than foraging for nectar or pollen. The honey stored throughout the year in the hive is for the bees to eat during the winter (this is why it’s important not to over harvest honey). During November, the bees do not eat much of their honey at all. There isn’t much happening in the hive in November, brood production is still very low and the bees are simply keeping their cluster warm. 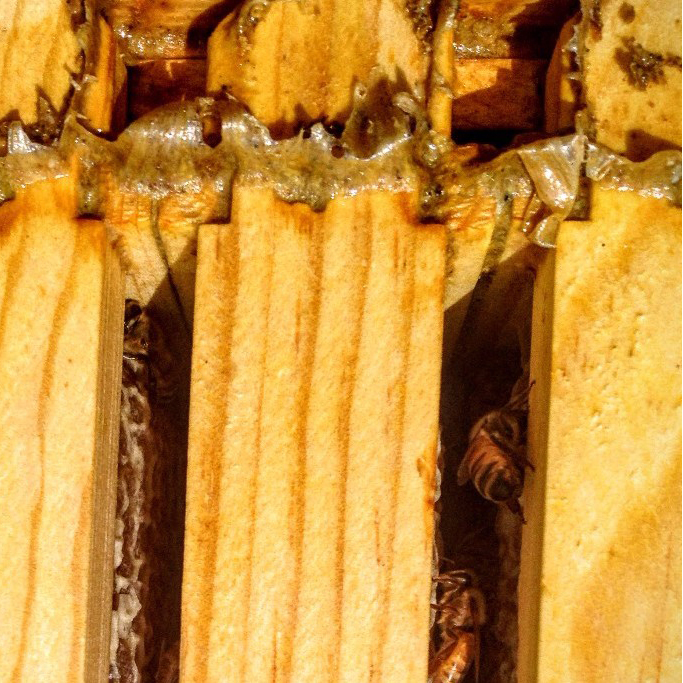 During the winter, brood production is the main demand on honey stores with most of the egg laying by the queen occurring in late January through March. The bees will eat about 7 pounds (about 2 medium frames) of honey in November. Cold days don’t leave much for bees to do except keep the brood warm. But on the rare warm day, you may find the bees bringing in pollen. Trees are major sources of pollen for the bees, and some can start making their pollen available in December. Look at the entrance of your hive on a cold day and you will hopefully find this. This shows you that your bees are working hard to clean out the hive. When you don’t see activity on a warm day, it’s not a good sign. Planning your fall hive management, keep in mind, that winter is too cold for a beekeeper to open a hive and inspect frames with brood as they would during the spring or summer. Doing this would be too disruptive to the hive, especially on cold days below 50°F. 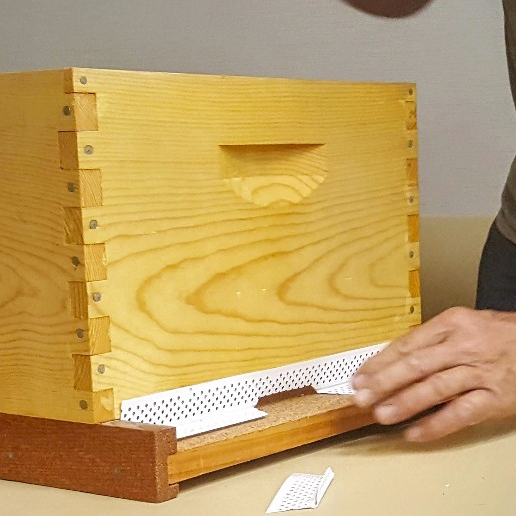 Instead, a beekeeper can monitor the health of a hive externally. For wintering bees in northern climates with long winters, some beekeepers wrap their hives with insulation. It’s not necessary for wintering honey bee hives in southern states. If you have questions about insulating beehives for winter, better to take a consultation in local bee club or beekeeping supplies – may be in your region you’ll need beehive insulation wrap or insulated beehive cover. An inexpensive infrared thermometer can be used to look for warm areas on the exterior of the hive. If you are interested in checking your bees during the winter, you can purchase an infrared thermometer, or a thermal camera (during winter, the bees do not heat the whole interior of the hive, only their cluster) or a hive scale. If you want to have a look at the bees, you can live the top cover off and look down through the frames through the hole in the inner cover. If using a screened bottom board, you can look under the hive to see the cluster or shoot a video by holding your phone under the screen. Watch the entrance on warm days to see if bees are flying and carrying out dead bees. It is a good practice to lift your hives from the back of the bottom board. Lifting the back half of the hive just enough to get an idea of its weight. If you do it throughout the year, it gives you an idea of how much honey the hive is gaining or losing. If mice are a concern, you can install beehive mouse guard – an entrance reducer in front of the hive. It doesn’t have to be the wood strip designed for beekeeping. We have used blocks, twigs, and foam before. Our favorite is a drywall vinyl corner. Ventilation of a hive during winter is at least as important as it is during the summer. Cold weather will rarely kill a hive of bees, but moisture will. It’s the same for bees as for us when it comes to cold air. Being cold isn’t fun, but being cold and wet is miserable and can become dangerous. Allowing the cold, damp air inside of a hive to escape freely is essential. You do this by having two separate areas for air to escape. One can be the bottom entrance and the other can be made by placing a small stick under the telescoping cover and above the inner cover. We use a brick place on top of our outer covers as a code for how healthy a hive is. During winter, the brick doubles as a weight to keep the outer cover from blowing off. All of these things can be done before November but should be done by the first big cold snap. After taking care of the bees, it is time to look forward to next year. 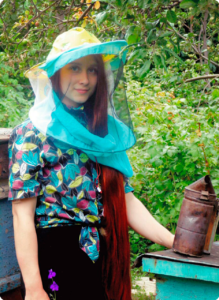 A 2nd-year beekeeper has to face some obstacles they didn’t have to face their 1st year. Overwintered hives have a high probability of swarming. Also, when people find out you keep bees, you will often get calls to remove bees. Even without planning for it, 2nd and 3rd-year beekeepers will likely have more hives than they may be ready for. You can save money by ordering your equipment now so you are ready. The cold winter nights can be used to assemble equipment, saving you money now and time in the spring. The end of December marks a major change in your bees. Their goal changes and the risk of starvation increases. Beekeepers are making plans for the following year, but there are a couple things a beekeeper can still do with their bees. While it may not seem like much is going on in the hive, the bees are quietly waiting for the end of the month. The shortest day of the year is December 21st. Starting on the 22nd, the queen will start laying more and more eggs. Somehow, in the darkness of the hive, the queen knows it is time to start the process of getting the hive ready for spring. She will continue to lay more and more eggs all the way through spring. The build-up of the bee population is very gradual at first. Late December through February are typically the coldest months of the year. If in January, the queen laid too many eggs at one time, there wouldn’t be enough adult bees to keep the newly laid eggs warm. Once the first round of new eggs hatch, the queen can then lay more eggs the 2nd round. To keep the expanding brood nest warm, the bees must form a tighter cluster around the eggs/brood. Fortunately, as more bees hatch out, there become more bees to share the responsibility and to make the cluster bigger. The picture below shows the top of the winter cluster. A larger cluster does have its downside though. The honey stored previously in the year will start being consumed at a faster rate. As the bees require more honey, the cluster will slowly migrate over the honey. The nest will likely not be in the top box with all the honey, nor in the bottom box where it started winter with. In December, it will ideally be somewhere in the middle. Some types of honey bees will build up in population faster than others and are more or less conservative with their honey reserves. This is where some of the differences in Italian, Russian and Carniolan bees show themselves. December 21st and 22nd are the shortest days of the year and mark the beginning of the new year for bees. As soon as the sun starts shining longer, bees will begin warming the brood nest in preparation for the queen to lay more eggs. A look inside the beehive through the inner cover. The edge of the bees shows where the winter cluster starts and stops. 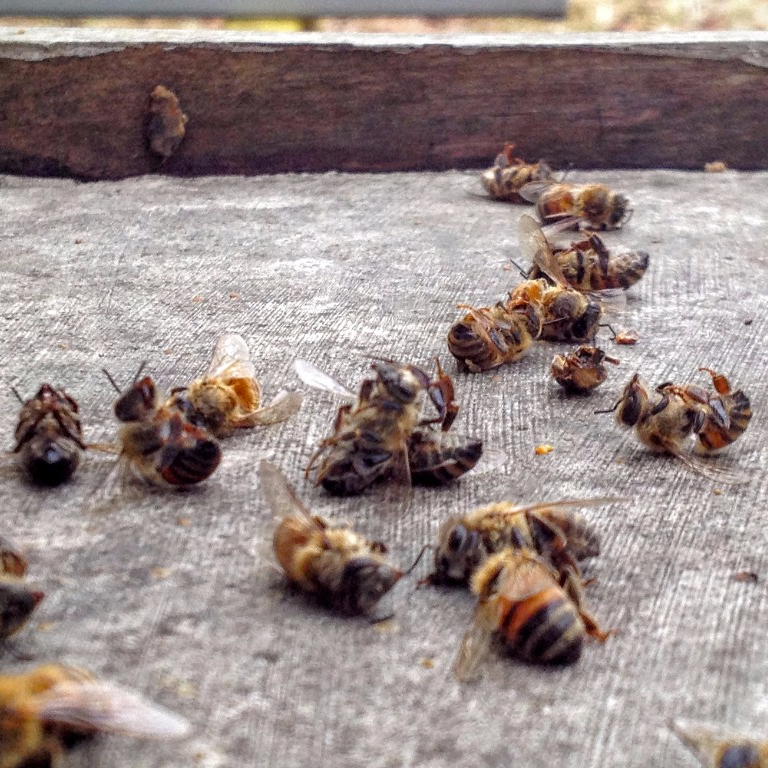 Dead bees in front of the hive during the winter is a good thing. It shows that the bees are still alive on the inside, and are cleaning the inside out during warm days above 50°. Entrance reducers are often installed during the winter to keep mice out. Or you can buy specialized beehive mouse guard. We don’t necessarily use them for that reason. Winter is here and the bees are in official survival mode and are doing all they can to conserve resources. There isn’t much a beekeeper can do for the bees now, so your attention can turn towards other bee activities. Winter is a great time to move a hive of bees if you need to. A cold day below 40° is the best time to move them. The cold weather will keep them inside during beehive moving, but still close the entrance completely and strap the boxes together. While the bees are inside the hive, you can also touch up the paint on hives with bees in them. The corners of the boxes are most susceptible to rot, so make sure you get those. Planning for next year is best done before the year begins. Anticipate equipment needs for the upcoming bee season. Do you want to expand your hives? Do you want to be able to catch swarms? Do you want to try your hand at splitting a hive or even selling one or two nucleus hives (there is a huge market for them)? Are you going into your 2nd or 3rd year with a healthy hive? If the answer is yes to any of these, it’s important to have equipment on hand before spring starts. You can order now and assemble and paint yourself to save a few dollars. Beekeepers always need lots and lots of frames. Winter is the best time to assemble them, so they are ready when you need them. Boxes, boxes, and more boxes. We are usually stocked and ready for spring. You don’t need all these on hand, but it’s good to have a couple boxes ready when you find some queen cells. If you are going into your second or third year with a hive, you will probably need another box or two for that extra honey! This is the best time of the year to order packages or nucleus hives as well. Both may require a deposit, but the nucleus hives available go quickly. If you are so inclined, you can also make pollen patties to be used in the spring. They aren’t necessary but can help your hive increase their population really quickly in the early spring. Winters a great time to increase your bee knowledge. Learn the difference in wasps and bees and be able to identify a few of the main flying insects. The threat of wax moth damage and small hive beetle damage is minimal during cold months. Neither insect can thrive in cold weather and freezing temperatures will kill both in empty boxes. In my experience, between November 1st and the first nectar flow of the next year, one normal hive consumed nearly 20 pounds of honey. One average medium frame full of honey will weigh 3 1/2 – 4 pounds. If you don’t believe your bees have 20+ lbs of honey, it is important to feed them. It’s not a great idea to feed bees syrup throughout the whole winter. There are plenty of beekeepers who will do it, but it can cause more problems than it can cure. A better option is to feed dry granulated white sugar. Instead, alternative feeding bees – dry sugar. As an alternative, bees will eat dry sugar if they need to. When giving them dry sugar, the “mountaintop” method (seen here) is the most common way to feed them. It doesn’t solve the problem of the bees not leaving their cluster to eat. But if you do get days warm enough for the bees to break cluster, they can get to the sugar to eat it. If you want extra insurance against starvation or fear that your bees have not stored enough honey/syrup, you can feed bees using the mountaintop method. This involves adding dry sugar to a place where bees can get to it. Dry sugar can be placed above or below the inner cover. As a rule of thumb, the bees can turn 1 gallon of thick 2:1 syrup into 1 deep frame of capped “honey” or 1.7 medium frames of capped “honey”. January is much like December, but bees are getting very busy in the hive. More and more bees are hatching out and the queen increases her egg laying even more. The occasionally warm day will allow the bees to forage on pollen, an essential food used to raise brood. The risk of starvation inside the hive increases as well. January is a big month for bees since Dec 21st the sun shines longer and this causes the queen to start laying more eggs. With more eggs being laid, the bees require more honey to survive. The center of the brood nest expands towards the honey, allowing the bees to eat the honey before the queen lays an egg in the same cell. This process happens pretty slowly at first, as the population of the hive is at it’s lowest in early January. The small population of adult bees keeps the eggs and larvae at 95°F, so the queen can’t lay more eggs than there are adult bees to warm them. Only as the bees hatch out, is the queen able to expand the brood nest further. The chance of starvation is typically minimal in January, as the queen hasn’t started laying at 100% capacity yet. This happens in March and April. January is a very cold month, but there are typically short periods of warmth which are crucial for the bees health. On warm days, the bees are able to “break” their cluster and go to another part of the hive to eat honey. It’s possible for bees to starve because it was too cold to crawl to another frame to eat honey. These warm days (above 50°F) allow bees to take a bathroom break as well. Bees keep the inside of the hive clean, and “holding it” until a warm day helps with that. Watch them leave the hive this time of the year and you may actually see them relieving themselves. One of the more important tasks of the new year for bees is to forage for pollen. Pollen is crucial for the bees during January and February if they are going to survive the year. The pollen is used with raising the eggs the queen is laying. Look for maple trees budding this time of the year and more than likely you will see bees foraging on the buds for pollen. January and February are important months for pollen collection. On days about 50°, bees will venture out in search for pollen. 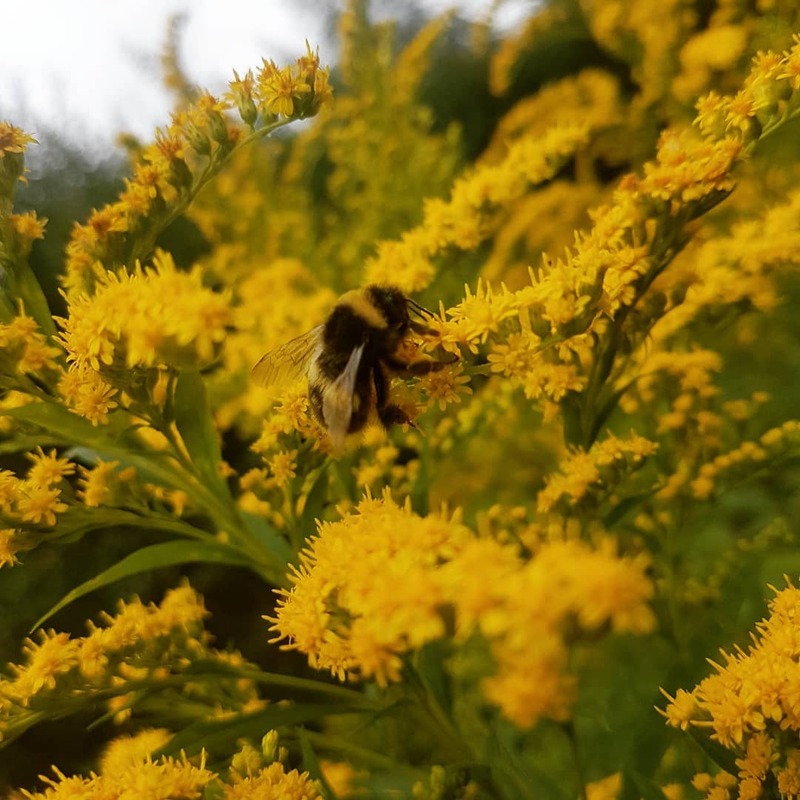 Pollen is brought back and used to support growing bees. Avoid opening the hive this time of the year, the propolis seals the bees made during the fall help keep the cold out. Help your bees by keeping the hive shut. The winter cold of January makes it extra hard on the bees. It’s best not to open the hive when it’s too cold for the bees to fly. Though you can remove the top/telescoping cover to replenish or add dry sugar as an emergency food source for your bees and best bee food for winter. An example of the damage that wax moths can do. Wax moth damage can be evidenced by the presence of webbing and tunnels bored through the comb. Notice the gray larva wax moth on the right and the adult stage moth on the bottom center. 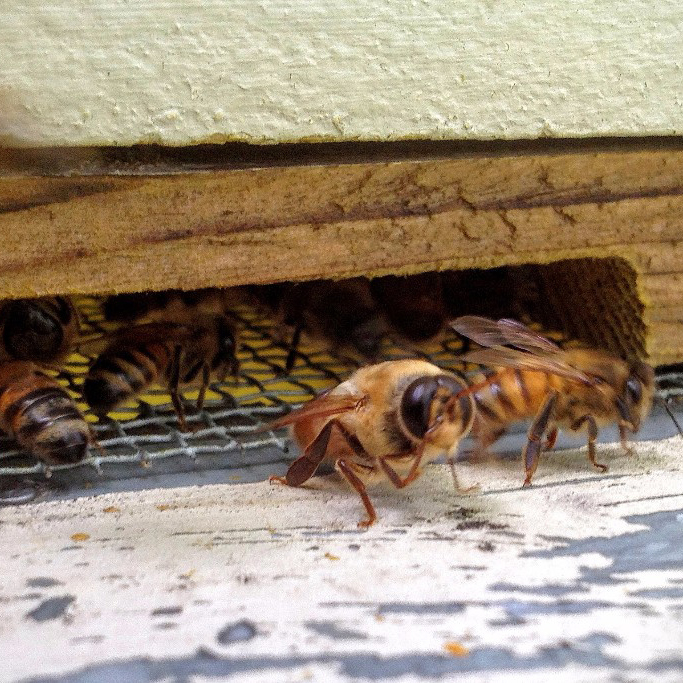 January is still a “calm before the storm” period for beekeepers. It may be the month with the least amount of responsibility for the beekeeper. But like anything, if you fail to plan, you can plan to fail. This month is the perfect month for getting your equipment ready for bee season. Make adjustments to the mistakes made in the previous year, buy honey harvesting equipment and make plans and goals for the new year. The cold, dark evenings are great for assembling frames or boxes, so order now so you have them when you need them. Take advantage of the cold weather and do some cleaning up around and under the hives. The cold weather is a good time to touch upon the paint on the outside of the hives with bees in them. January is a time when beekeeping clubs host beginner courses. It’s a good idea to brush up on the basics of beekeeping, so consider attending one, even if you have had bees for a year. Some are as long as 6 weeks or as short as one day. It is a great idea to read up in advance of a beginner class. There is a lot of jargon and beekeeping terms that can be very confusing to the uninitiated. February is when the bees start building momentum in the hive. Queen laying increases significantly more than in January and the risk of starvation increases. More pollen is available on trees, but the bees need warm days in order to harvest it. Bees are not collecting honey yet, but many of the bees who will forage for the nectar in the spring/summer are now only eggs. February is a slight extension of the events that occur in January. Days and nights are still particularly cold, but there are more bursts of warm weather that will affect your bees. On those warm days, which for the bees is above 55°, the forager bees will leave the hive looking for pollen. Pollen is in high demand in February because the bees need the protein from the pollen to feed their larva. They combine the fresh pollen with the residual capped honey from last year to feed their bees. There is a lot you can tell from your hive by just watching the entrance. Activity significantly increases at the entrance around 1-2 pm each day, so that is the best time to observe. Look for bees bringing in pollen on their back legs, that is always a good sign. If you don’t see any activity, it is a possibility the bees are dead. While the amount of eggs being laid by the queen is increasing, it isn’t by too much compared to January. The reason for this is the adult bees have to keep the capped and uncapped brood warm, about 90° and above. If a major cold snap occurs and the bees have to ball together very tightly to keep warm, it may leave the outer edges of the brood nest partially exposed to the cold. If the brood gets too cold, it won’t survive and all the cold brood must be removed from the hive during the next warm period by the bees. This is why the bees slowly expand their egg laying, so they will have enough adult bees to keep the unhatched bees warm. With each round of capped brood that hatches out, the population will increase. In early February, the adult population may be around 10,000 bees, but by the end of the month, it will likely be closer to 18,000. February is a very popular time for beekeeping clubs to hold their beginner classes. February will often present beekeepers the first opportunity to take a look inside the hive. But only do so on days that are above 55 degrees. Try to disrupt the hives as little as possible and preferable do so just before a warm spell. Feed your bees only if necessary to prevent starvation this time of the year. If they have over 4 frames of capped honey inside the hive, your bees are in good shape. But that 4 frames can be eaten quickly, so keep an eye on it until spring comes. February is usually one of the last consistently cold months of the year. Meaning, there are not many reliable sources of nectar for the bees to feed on during this month. If your hive has less than two or three frames of capped honey left for them to eat, you may consider feeding honey bees in winter. The queen is laying many more eggs in February compared to January, so the demand for food is going to increase every month until summer. You can feed them dry sugar or during a warm spell about 55°, you can feed them a syrup mixture. Days below 55° and the syrup will often be too cold/thick for the bees to drink. The cold of February makes it extra hard on the bees. It’s best not to open the hive and go through every frame when it’s cold. You can usually learn plenty by just taking a peek through the hole in the inner cover. On a warm day in February, you can pretty much count on seeing honeybees collected pollen from trees. Trees are heavy pollen producers compared to flowers, so when you see a budding tree in February look closely for honeybees. When foraging for pollen, honeybees brush the pollen granules from their hair and pack it into small concave spots on their back legs called a pollen basket. This is a piece of wild comb from a hive. You can see how the bees store their pollen in separate cells from their honey and brood. But pollen is often found very close to the brood as the bees need it readily available to feed their larva. This is what loose pollen looks like after it has been harvested using a pollen trap. Every color represents a different species of plant the foraged for pollen on. As popularity in keeping bees grows, so do the number of great beekeeping books. A lot of them cover the same information, but there are a few exceptional ones with great images. Some of the big libraries carry a good supply of beekeeping books. Beekeepers use lot’s of terms to describe their tools, brush up on the specifics when the weather is cold. A super (short for superstructure) refers to a box placed above the boxes used for the main brood rearing. March is a big month for bees. If winterizing bee hives was successful and bees feel good, they start thinking about swarming in early March and are well on their way to swarming by late March. Massive bee population expansions happen in March and you start to get the earliest glimpses of flower blooms. Tie up your bee boots folks, cause March is when things start to pick up for the bees.